520 square feet of viewing space in Times Square that is! To celebrate National Foster Care Month, client Annie E. Casey Foundation turned to Geomatrix to create a 30 second spot to play on the CBS “Super Screen” which is strategically positioned at 42nd Street between 7th and 8th Avenue in the heart of the Times Square Plaza. 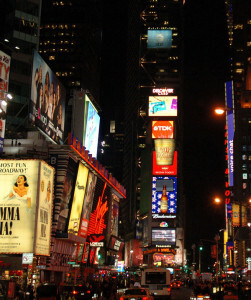 The creative challenge was to create an impression using visuals only, since there is nothing but city-sounds in the bright lights of Times Square. Using photos and graphics Geomatrix producer Patrick Volk worked closely with Annie E. Casey Foundation Senior Communications Manager Roye Anastasio-Bourke to create a compelling message of the needs of foster youth. The video was completed, encoded and uploaded for approval then linked directly to CBS just in time for its one-month run.